Indium Corporation's Vice President of Technology Dr. Ning-Cheng Lee will deliver the keynote presentation at the IMAPS 44th International Symposium on Microelectronics, October 9-13, 2011, in Long Beach, CA. His presentation, Trends of Solder Alloy Development, will discuss the evolution of lead-free soldering as the industry moves rapidly toward green manufacturing. In addition, Indium Corporation will be presenting four papers at the technical conference. 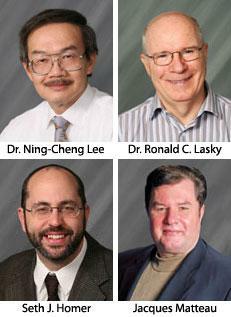 Dr. Lee will present Epoxy Flux - A Low Cost High Reliability Approach for PoP Assembly. This paper describes the benefits of using epoxy flux to reinforce the solder joints of assembled package-on-package (PoP). Ronald C. Lasky, Ph.D., P.E., Senior Technologist, will present Applications of Solder Preforms to Improve Reliability, which explains the process, design, and assembly methods for solder fortification® using preforms. Seth J. Homer, Product Specialist, will present Evaluation of Test Protocol for Eutectic Die-Attach using High Power LEDs. This paper details process recommendations for the implementation of eutectic gold-tin (AuSn) materials in high-power semiconductor devices, such as high-brightness LEDs. Jacques Matteau, Global Sales Manager, will present Nanobond® Assembly: A Rapid, Room Temperature Soldering Process, which describes the benefits, process, and applicability of this revolutionary technology. Dr. Lasky has more than 30 years experience in electronic and optoelectronic packaging and assembly, including work at IBM, Universal Instruments, and Cookson Electronics. He has authored or edited five books on science, electronics, and optoelectronics, as well as several technical papers and articles for Scientific American. Dr. Lasky holds numerous patent disclosures and is the developer of several new concepts in SMT processing software relating to cost estimating, line balancing and process optimization. He is the co-creator of engineering certification exams in electronics assembly and is the director of Dartmouth's Six Sigma Program. Dr. Lasky was awarded the SMTA Founder's Award in 2003. He also authors a technology blog which can be found at blogs.indium.com/blog/an-interview-with-the-professor. Seth has been with Indium Corporation for over 15 years, serving as manufacturing supervisor for various engineered electronics assembly materials, including solder spheres, sputtering targets, indium chemicals, and solder preforms. Seth has also worked extensively with Indium Corporation customer support teams, especially those in China, Singapore, and Europe. He also authors a blog which can be found at blogs.indium.com/blog/seth-j-homer. Jacques is responsible for driving the market development and sales of Indium Corporation's NanoFoil® products to the target industry, where it is used to NanoBond® targets to the backing plate. His focus is on semiconductor, disk drive, and solar industries throughout Asia, Europe, and the US. Jacques has over 20 years of experience with thin film technologies and the electronics industry. He has a strong technical materials background with a degree in Physical Chemistry and Materials Science from the University of Ottawa. Indium Corporation will be at booth #235. For more information about IMAPS 2011, visit www.imaps.org/imaps2011.